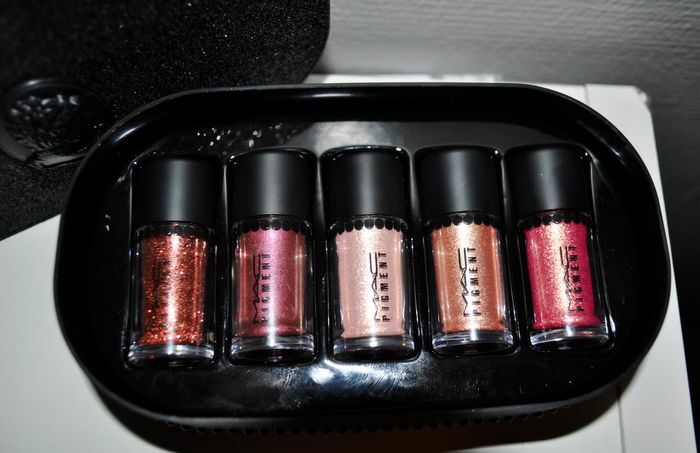 A little while ago I went out and bought the MAC: Objects of Affection, pigment and glitter giftset in the pink/rose colors. A week beforehand I worked with pigments at NWMA and I could not believe why I had not used this amazing product before. I chose to buy the Pink/Rose edition first, since I am loving those colors this winter and with the rose, pink and golden colors it compliments all skin- and eyecolors. The price was 270 DKKR ($45 US) which is super cheap for a set of 4 pigments and one glitter. Usually the price is 175 DKKR ($30 US) for one pigment or glitter and while these are only half the size, they last quite a while. Whisper pink: A very subtle shimmer pink color, really good for high light purposes and in the inner corner of the eye to really make the look pop. Tan: My absolute favorite! A golden rose color, applies perfectly and evenly on the lid, perfect for a smokey look. Rose: Probably my least favorite. It's such a beautilful pink color and looks absolutely stunning in packaging but applied it is not as pigmented as I hoped for and I find it hard to apply evenly. However, use the right paintpot underneath and it will look great and combines well with the other pigments. Reigning Riches: The glitter in the giftset. I was quite surprised about this one! While being a glitter, it's really pigmented and rich in the color! I've owned glitters from other brands which had trouble staying on or applying well, but I had absolutely not trouble with this one and it's just perfect for a holiday evening look either on the whole lit or applied as a subtle twist on the outer corner of the eye. Heritage Rouge: The last pigment in the giftset, this is very matte compared to the other colors, I experienced no form of shimmer which is all fine, since I would combine this with reigning riches or under Rose. It's amazing to create a smokey look with this dark plum color. I am all in all really satisfied with this buy. I can use all of the pigments for many different looks, they last a long time since you don't use much of the product when applying it and it stayes on for the whole day! Can't wait to use them again really soon! 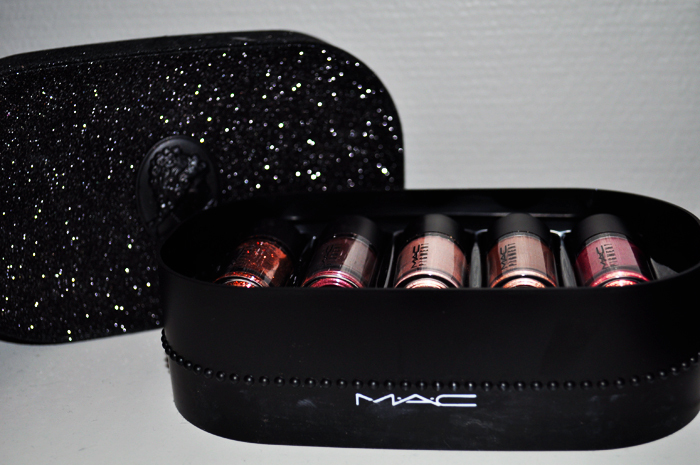 Have you tried any of the MAC Holiday products, which one is your favorite?